We’d love your help. Let us know what’s wrong with this preview of Bridge of Time by Lewis Buzbee. Best friends Lee Jones and Joan Lee have a lot more in common besides their names. On the eve of their class trip, they each learn their parents are getting divorced. Ugh. The class trip is a dud, so Lee and Joan steal away to talk. What follows is an afternoon nap in a lighthouse, walking up to find the Golden Gate Bridge gone--gone!--and meeting a young man named Sam Cle Best friends Lee Jones and Joan Lee have a lot more in common besides their names. On the eve of their class trip, they each learn their parents are getting divorced. Ugh. The class trip is a dud, so Lee and Joan steal away to talk. What follows is an afternoon nap in a lighthouse, walking up to find the Golden Gate Bridge gone--gone!--and meeting a young man named Sam Clemens, who is on the run from a mysterious stranger. To ask other readers questions about Bridge of Time, please sign up. I have a too long recommended for list for the recommend to field. I can heartily recommend this book to 9 to 13 year olds (and those young at heart) who enjoy historical fiction stories and/or speculative fiction time travel stories, kids who are going through or have gone through divorce or another loss, who are ambivalent about change and/or growing up, who have an interest in San Francisco and/or San Francisco history, have enjoyed any books by Mark Twain, who are looking for a terrific frie I have a too long recommended for list for the recommend to field. I can heartily recommend this book to 9 to 13 year olds (and those young at heart) who enjoy historical fiction stories and/or speculative fiction time travel stories, kids who are going through or have gone through divorce or another loss, who are ambivalent about change and/or growing up, who have an interest in San Francisco and/or San Francisco history, have enjoyed any books by Mark Twain, who are looking for a terrific friendship story, who are having any kind of rough time whatsoever, who are interested in history in general and curious about the future, who are introspective, and anyone who enjoys a wonderful story. I loved this book. The only thing that felt a little odd to me were some of the interactions between Joan and Lee, but I got used to their communication style and it ended up working well for me. I loved the creative chapter titles, containing multiples words/phrases that give information about chapter content to come. I loved the ingenious time travel aspects, and Mark Twain, especially the Tom Sawyer material, and especially Samual Clemens the man. What a hoot to have him in this story in this way. I love the glimpses of old San Francisco; they were very enlightening. I liked all the characters and their relationships. The story is so, so creative. The premise is great, and its fruition worked, at least for me. I particularly liked the San Francisco setting, the main reason I got to the book as quickly as I did, present (2012) and past(s) and possible future. Great fun! I love recognizing so many places. Oh, and the other main reason I got to this book is because I loved another book by this author: The Yellow-Lighted Bookshop. I’m saddened and perplexed that of the 10 copies at the San Francisco Public Library, 9 of them for lending, 1 of those borrowed by me, that 5 are on the shelf, available. Today’s San Francisco kids, both sexes, all races, especially those 9 through 13: read this! All copies should be checked out, with a reserve queue. Perhaps many kids/families have purchased this. I have seen copies in local independent bookstores. This book would have been ideal for me when I was 11-12, after the death of my mother. It would make a fine bibliotherapy book for kids who are struggling with any loss or change. I’d like to see it in many households, and all school libraries and children’s hospital libraries. It might be a good choice for reluctant readers too, depending upon their interests. And, look at all the bookshelves I was able to use for this book! This was an enjoyable time travel book with a bit a twist. The young time travellers encountered a young Samuel Clemens. What if you woke from a nap to discover a familiar landmark had simply disappeared? What if you could meet yourself coming and going? What if you landed splat in another time and found yourself running for your life, and more than once? In Lewis Buzbee's latest literary mystery, Bridge of Time, a school field trip leads to a journey into the past with a surprising time traveler for a guide. On the eve of their class trip to Fort Point, Lee Jones and Joan Lee each each learn their parents are gett What if you woke from a nap to discover a familiar landmark had simply disappeared? What if you could meet yourself coming and going? What if you landed splat in another time and found yourself running for your life, and more than once? 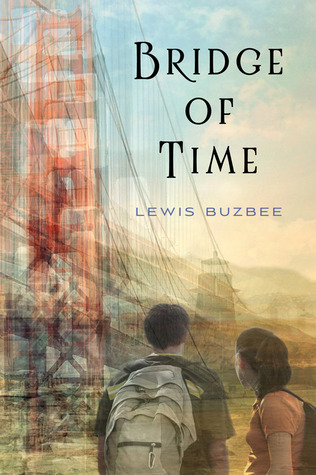 In Lewis Buzbee's latest literary mystery, Bridge of Time, a school field trip leads to a journey into the past with a surprising time traveler for a guide. On the eve of their class trip to Fort Point, Lee Jones and Joan Lee each each learn their parents are getting a divorce. Needing a place to talk over the bad news, they sneak away from the class and hide in the lighthouse. But bad news can be exhausting, even when shared with a sympathetic best friend. They fall asleep. When they wake up and look out the lighthouse windows, the Golden Gate Bridge has vanished. And that’s not all that’s different. In the fort below, grass has replaced concrete. Soldiers are loading a real canon. Other soldiers have rifles and seem eager to use them. Immediately Joan and Lee crouch down to try and figure this out. Then they hear footfalls on the lighthouse stairs. The door opens. A young man dressed in black enters. His clothes are as old fashioned as those of the soldiers, and Joan and Lee can tell that, like the soldiers, he’s definitely not part of the field trip. He says his name is Sam Clemens. He says they have come “unstuck” in time, something that regularly happens to him. At present (this new present) it’s 1864. As in earlier mysteries, Buzbee weaves humor, history, and philosophy into his fast-paced tale. In one scene, Sam—who is actually Mark Twain—wrestles with twenty-first century slang, managing to get “dudes” and “totally awesome” right, but then adding, “I was also freaking the out.” In addition to the frightening aspects of San Francisco’s racism in 1864, there are softer brushstrokes that give the era: When Joan says she’d like to have a bath, Sam says, “Oh you children of the future. What have they done to you? Are you certain? It takes a good while to rustle up a proper bath.” (And so it does in 1864.) At the end of the book, Sam gives them a nice explanation of why the lighthouse at Fort Point is a focus for time travel. (But you’ll have to read the book to find out.) In one vivid scene the three time travelers fall into what Sam calls a “tumble”, shooting back and forth from one time to another so rapidly it could be a light show with strobe lights. As was true of Buzbee’s two earlier literary mysteries, Steinbeck’s Ghost and The Haunting of Charles Dickens, Bridge of Time is a book to savor and read more than once. This was an entertaining time travel story. Lee Jones and Joan Lee are best friends but the end of eighth grade is a time of lots of changes for both of them. Changes that they are both afraid might destroy their friendship. Joan will be going off to a different high school in the fall and both sets of parents tell the kids that they are divorcing. Their different personalities have them reacting differently. Lee is more laid back; Joan is more uptight. When the class field trip is changed from a This was an entertaining time travel story. Lee Jones and Joan Lee are best friends but the end of eighth grade is a time of lots of changes for both of them. Changes that they are both afraid might destroy their friendship. Joan will be going off to a different high school in the fall and both sets of parents tell the kids that they are divorcing. Their different personalities have them reacting differently. Lee is more laid back; Joan is more uptight. When the class field trip is changed from an amusement park to a historical park, Joan and Lee ditch the crowds and go off to explore on their own. They wind up in a lighthouse where they talk and then both fall asleep in the wonderful heat of the room. When they wake up, things have changed. Their San Francisco is gone and the cannons that are filled with cement in their time are blasting away. Things get even more complicated when a man who introduces himself as Sam Clemens bursts into the lighthouse. Thus begins a wild adventure as the two kids, along with Sam Clemens, learn about travelling in time, explore San Francisco in 1864, and try to find a way to get back to their own time. They each have to face their fears for the future before they can get back to their own times. Lee likes living in the past. He doesn't want to go back to 2012. He would rather go back to the time when he is eight and his family was still happy and try to find a way to change the future. Joan doesn't like 1864. She is Chinese and the Chinese were treated very badly in San Francisco then. But she doesn't want to return to 2012 either. She would prefer to travel to 2022 when she would be grown and all the chaos of 2012 would be over. Sam, who is in his time, has some doubts about his future too. He has traveled to the future and seen himself as the famous writer Mark Twain. But he doesn't feel confident that he could ever become that writer. Lewis Buzbee’s Bridge of Time is a compelling story about two young best friends, Lee Jones and Joan Lee. On a class field trip to Fort Point, they each learn their parents are getting a divorce. They drift apart from their class and find a lighthouse to talk over about the bad news. The long day had made it very exhausting and they eventually take a nap in the lighthouse. Upon waking up, they look out of the lighthouse windows and they see that the Golden Gate Bridge is gone. Below they see sol Lewis Buzbee’s Bridge of Time is a compelling story about two young best friends, Lee Jones and Joan Lee. On a class field trip to Fort Point, they each learn their parents are getting a divorce. They drift apart from their class and find a lighthouse to talk over about the bad news. The long day had made it very exhausting and they eventually take a nap in the lighthouse. Upon waking up, they look out of the lighthouse windows and they see that the Golden Gate Bridge is gone. Below they see soldiers loading up the canons that are affixed to the fort. They take refuge inside the lighthouse when a young man named Sam Clemens comes in and tells them they have become “unstuck” in time, an occurrence that frequently happens to him. The two best friends learn they are in the year 1864 and set forth on an adventure throughout the many eras of San Francisco trying to figure out how to get back into their own time. Buzbee brilliantly mixes adventure, history, humor and philosophy into this fast-paced story. The description of 1864 San Francisco is magnificent. Even the darker side of that era’s racism is covered in frightening details. The meaningful history presented in the tale is just as interesting as its remarkable plot. Bridge of Time is aimed at middle schoolers, but I found myself enjoying it. Having a male and a female main character is a plus. Lee and Joan as well crafted and have similar problems that many kids their age face. Aside from their “unstuck” predicament, many middle schoolers will easily relate to them. Buzbee’s writing style kept in tone with the book’s history lesson and cleverly adventurous plot without one overtaking the other. A promising start peters out into dull, generic middle grade fiction in this time-travel tale set in San Francisco and featuring young Mark Twain, or rather Sam Clemens. Joan and Lee seem interesting enough protagonists when they are introduced, and I loved the parallel-but-opposite scenes where they find out about their respective parents' divorce. Unfortunately, that is as good as the book gets. The early hints of character differences (Joan is methodical, rule-abiding, and future-focused; Lee A promising start peters out into dull, generic middle grade fiction in this time-travel tale set in San Francisco and featuring young Mark Twain, or rather Sam Clemens. Joan and Lee seem interesting enough protagonists when they are introduced, and I loved the parallel-but-opposite scenes where they find out about their respective parents' divorce. Unfortunately, that is as good as the book gets. The early hints of character differences (Joan is methodical, rule-abiding, and future-focused; Lee is impulsive, rule-indifferent, and past-focused), come to completely define the characters and are all the personality that either gets. Sam Clemens' dialogue is authentically reminiscent of the writing of his books, which at first is delightfully, but tends to grate after a while. All of the other characters are bland nothings, even the eccentric, implied-lesbian couple. The resolution of the divorce arc is cliched and unsatisfying. It is fair too neat for the future selves to reassure them that everything will be fine after the suckish first year. Not everyone's life does turn out fine, and divorce doesn't always make everyone happier in the long run. I also felt that Lee got cheated by the resolution. Joan wants to go to the future and skip past the hard parts. While she doesn't get to skip the rough times, she does get to see the future, and know that the "beyond the divorce" years she wants to get to are out there waiting for her. Lee, on the other hand, doesn't want his parents to divorce at all. He doesn't understand why they are divorcing, and he wants to fix it by going back to when his family was happy. But he never gets even an explanation for the divorce, it happens and he can't fix it, and his sojourn into the past just ends with the future-pep talk that Joan got; the actual past itself didn't matter. There are some adventure stories that you race through to discover what will happen next and next and next after that and all the way through to the end. The joy of those books is satisfaction that comes with being done and knowing what happened. Then there are the kind of adventure tales Lewis Buzbee writes...where even though you're desperate to know what the turn of the page will bring, you can't help yourself from wanting to linger in the world he creates. Bridge of Time is definitely one of There are some adventure stories that you race through to discover what will happen next and next and next after that and all the way through to the end. The joy of those books is satisfaction that comes with being done and knowing what happened. Then there are the kind of adventure tales Lewis Buzbee writes...where even though you're desperate to know what the turn of the page will bring, you can't help yourself from wanting to linger in the world he creates. Bridge of Time is definitely one of those stories. One day, best friends Lee and Joan find themselves 'unstuck' in time after wandering away from their boring class trip. They end up in 1864, during the early formative days of San Francisco's past to encounter a city that is vastly different and yet still not totally unfamiliar. As they begin their journey back, they encounter a reporter who will one day became Mark Twain, and who, just like his beloved characters, has a knack for adventure. Any time a story involves time travel, there is bound to be a lot of intriguing action, both past and future. I must confess that I love time travel stories and always have. I love pondering the puzzles they create. Because of the unique approach this story takes to the concept, there is no lack of things to ponder. In fact, there are so many deeper concepts in this book, hiding just under the surface, that I was still unraveling it for days after finishing it. Besides the core adventure, the book is a poignant and honest look at divorce. It is also a fascinating and sometimes brutal examination into the history of San Francisco and the role racism played in its development. And by looking at Sam Clemens' transition into Mark Twain, the book subtly defends the ability of fiction to have as much of a social impact as journalism. At the heart of the book however is the journey of two friends, struggling with the uncertainty of their future. Their fears and concerns are the kind that most middle school kids are all too familiar with. The true adventure is watching them grow stronger through it all. I couldn't get through this book, no matter how hard I tried. I had actually started to read it once before but couldn't make it through the end then either. I had thought it was only because I was busy at the time that I couldn't get into it. But no. The synopsis sounded great. Who doesn't like time travel? But as I read, I struggled to connect to the characters because I felt they were too frustrating. At first when they were panicking about being in 1864 instead of 2012, which was totally understandable, but after they did it 100 more times after that when it wasn't necessary got old. Another reason I had a hard time enjoying the book was the fact that Joan and Lee were total idiots. How could they not know it was Mark Twain? I mean come on!! I saw that coming a mile away! As soon as he said, "I'm Sam Clemens." I knew it was Mark Twain. But did they make that connection? Nope! I was beginning to think Joan and Lee weren't going to figure it out unless they saw a huge flashing sign. But FINALLY they figured it out when someone said "Mr. Twain". Joan and Lee had even said they had read Huckleberry Finn and Tom sawyer and they didn't know that Sam was Twain until just then. Please! That alone made me want to throw the book out the window. The third reason was the LOOKS. It drove me crazy!!! Nobody, no matter how long you have known each other or how well they know each other can convey a whole conversation in one look! It was sooo unrealistic. The last and final reason was that the story didn't flow. The grammar and style was too choppy for my taste. All in all I read only half of the book and just couldn't bear to continue. In my opinion, I would steer clear of this book and I will personally never read this again. I was not thrilled with this book for the first half...I was annoyed by the 'we're best friends and can communicate with LOOKS' business, but as the story picked up steam, the LOOKS slowed down. The central metaphor of this book about time travel is that time is a river... and it's always moving forward: "It's huge and it's up to us to figure out how we fit in." A good lesson for us all. Joan and Lee are best friends, not the most popular, and have each been given devesating news on the same night I was not thrilled with this book for the first half...I was annoyed by the 'we're best friends and can communicate with LOOKS' business, but as the story picked up steam, the LOOKS slowed down. Joan and Lee are best friends, not the most popular, and have each been given devesating news on the same night: their parents are going to divorce. The next day, at a school field trip, they run away from the group at Fort Point in San Francisco...and suddenly find themselves in 1864, in the middle of a Civil War setting. There they meet infectious Sam, who helps them escape and manage themselves in the San Francisco of 1864. That would be Sam Clemens, new arrival from Hannibal, MO, trying to make his way as a journalist and writer. It seems that Sam can also travel in time...he's also Unstuck. The city of San Francisco is as much a character in this book as Lee and Joan and Sam..."The past, present, and future all lived together." In order to stick to their own time, Lee and Joan and Sam have lessons they need to learn. A time-slip story of a boy & girl in San Francisco in 2012 who come "unstuck" in time, meet up with Sam Clemens (Mark Twain) as a young reporter, and have many exciting adventures trying to avoid racist attackers and get home. In fact, the kids are trying to get to a better time than the one they left - the best friends found out that they don't get to go the same high school, and both sets of parents just announced they were getting divorced. The most unrealistic aspect of the story is that A time-slip story of a boy & girl in San Francisco in 2012 who come "unstuck" in time, meet up with Sam Clemens (Mark Twain) as a young reporter, and have many exciting adventures trying to avoid racist attackers and get home. In fact, the kids are trying to get to a better time than the one they left - the best friends found out that they don't get to go the same high school, and both sets of parents just announced they were getting divorced. The most unrealistic aspect of the story is that either 13-year old would care that much about their parents' divorces - presumably things in both homes would have been deteriorating, and a 13-year-old is very likely to be relieved that the parents are finally taking care of themselves, and not just continuing on in quiet misery. It would make more sense if at least one of them was relieved. Also, Sam Clemens' contribution to the dramatic tension is his anxiety about not living up to the challenges that will result in achievements he sees (in a time-slip) himself accomplishing. At the same time, he is full of bravado and confidence. I found myself constantly mentally cross-checking with what I could remember about him, and found it a bit unrealistic, even though nothing was blatantly contradictory. Mark Twain's writings on race in society may not be well-known to the reading audience of this book, but the character's statements seem to fit with the historical record of the author's (mark Twain's) thoughts. In Bridge of Time, two eighth graders each receive the same news - their parents are getting divorced. The two are best friends with opposite names - one is Lee Jones and the other Joan Lee. The next day on a class field trip, they climb into the lighthouse at Fort Point in San Francisco, fall asleep, and wake up in 1864 with a young Sam Clemens. The book follows their adventures as they move through time, visiting San Francisco in many eras, and learn more about each other and themselves. This b In Bridge of Time, two eighth graders each receive the same news - their parents are getting divorced. The two are best friends with opposite names - one is Lee Jones and the other Joan Lee. The next day on a class field trip, they climb into the lighthouse at Fort Point in San Francisco, fall asleep, and wake up in 1864 with a young Sam Clemens. The book follows their adventures as they move through time, visiting San Francisco in many eras, and learn more about each other and themselves. This book is aimed at middle schoolers. Having both a male and a female main character is a strength. Historical information is presented in a meaningful manner that adds to the story without getting in the way. Aside from being "unstuck" in time, the kids have problems that other middle schoolers will relate to. In any event, I enjoyed reading an advanced reader copy of the Bridge of Time. It is scheduled to be published in May 2012. I so desperately wanted to like this book, but it just was not quite there for me. We have two 8th graders Lee Jones and Joan Lee that are best friends and have almost a "twin" relationship. The can read each others faces and have a bond much more like siblings. While on a class trip they disappear into a lighthouse and come out in the year 1864 in San Francisco. They immediately meet a man names Sam Clemens (which many know who that is) and he helps them navigate through the city during the 186 I so desperately wanted to like this book, but it just was not quite there for me. We have two 8th graders Lee Jones and Joan Lee that are best friends and have almost a "twin" relationship. The can read each others faces and have a bond much more like siblings. While on a class trip they disappear into a lighthouse and come out in the year 1864 in San Francisco. They immediately meet a man names Sam Clemens (which many know who that is) and he helps them navigate through the city during the 1860s. Awesome! Well, it could have been. 1) Anytime the plot stars moving, it's stopped dead by some character info-dumping how the time-travel plot device works. This books is a master class in how to tell not show and that's never engaging. Two best friends, Lee Jones and Joan Lee, slip away from a school field trip, scavenger hunt at the Civil War era Fort Point, which sits under one end of the Golden Gate Bridge in San Francisco. They move to roof of the fort where they can privately discuss both of their parents' impending divorces but realize the Golden Gate Bridge is missing and soon understand they are in a time travel adventure back to the times of Mark Twain when he lived in San Francisco. Interesting time-travel story, though it didn't quite completely gel for me. Still, I finished it, so the story had enough grip for that. I would probably have been more willing to suspend disbelief if the author had not included an actual historical figure. Best line: "Riders, please keep your arms and legs inside the space-time continuum at all times. And we do mean all times." I'm not rating this one, just making a few comments. It was alright. The main "mystery" was obvious so that kinda took away from the awesomeness. Too much focus was divided with side character that rambled and lost focus to story. However, I liked the relationship with the boy an girl. Just having them as simple friends and able to communicate with a look. And was nice when their story split. Painfully bad writing and enough cliches to last a lifetime, but it's time travel so I had to finish. Unfortunately, the author didn't feel the need to finish the story and leaves our characters 148 years before their own time period with the promise that they'll get home. What a cop out. Save yourself the trouble and look elsewhere. Fascinating time-travel fantasy with deeply appealing main characters. The interaction between the teenagers and Samuel Clemens is funny and moving. My only reservation was that the kids didn't know that Clemens was Twain--by their age, I think every kid has read some Twain books and learned about him. Best friends Lee and Joan are unhappy after learning both their parents are getting a divorce, and Joan will be transferred to a new school. As they are together taking a nap on one of the most boring field trips of their lives, they wake up in the year 1864. They then meet a famous person from history and realize the “time” they wil now be spending together will be anything but boring. I had great hopes for this book, but it didn't pan out. The story is bogged down by the efforts of the author to write in a cute or intriguing fashion. It just doesn't t develop, and I never felt any attachment for the characters. The idea of time travel as used in this book just isn't believable either. Oh well, I'm still looking for great science fiction for middle grades. Best friends Joan Lee and Lee Jones accidentally travel back in time to 1864 San Fransisco, where they meet Sam Clemens (e.g Mark Twain). It’s an entertaining read, and would be especially so for those with familiarity with San Fran’s landmarks and neighborhoods. I thought the book had some interesting plot twists and I thought the storyline was clever. However at times it got a little boring. I think overall if the book was maybe shorter it would have been better. Lewis Buzbee is a fourth generation California native who began writing at the age of 15, after reading the first chapter of John Steinbeck’s The Grapes of Wrath. Since then he’s been a dishwasher, a bookseller, a publisher, a caterer, a bartender, and a teacher of writing. He and his wife, the poet Julie Bruck, live with their daughter Maddy in San Francisco, just half a block from Golden Gate Pa Lewis Buzbee is a fourth generation California native who began writing at the age of 15, after reading the first chapter of John Steinbeck’s The Grapes of Wrath. Since then he’s been a dishwasher, a bookseller, a publisher, a caterer, a bartender, and a teacher of writing. He and his wife, the poet Julie Bruck, live with their daughter Maddy in San Francisco, just half a block from Golden Gate Park. His books for adults include The Yellow Lighted Bookshop, Fliegelman’s Desire, After the Gold Rush, and First to Leave Before the Sun. His first novel for middle grade readers, Steinbeck’s Ghost, was published in 2008 by Feiwel and Friends and was selected for these honors: a Smithsonian Notable Book, a Northern California Book Award Nominee, the Northern California Independent Booksellers’ Association Children’s Book of the Year, and the California Library Association’s John and Patricia Beatty Award. A second middle-grade novel, The Haunting of Charles Dickens, was published in 2011 and won the Northern California Book Award, was nominated for an Edgar, and was selected as a Judy Lopez Memorial Honor Book. A third middle-grade novel, Bridge of Time, was published in May 2012--time travel, San Francisco, Mark Twain. A new nonfiction book for adults, Blackboard: The Life of the Classroom, has just been published by Graywolf Press.